From New Ravenna Mosaics, and part of the new Illusions Collection, is Paseo – designed by Paul Schatz in polished Cream Onyx, honed Allure and honed Calacatta Tia. From New Ravenna is the Illusions Collection designed by Sara Baldwin and Paul Schatz. 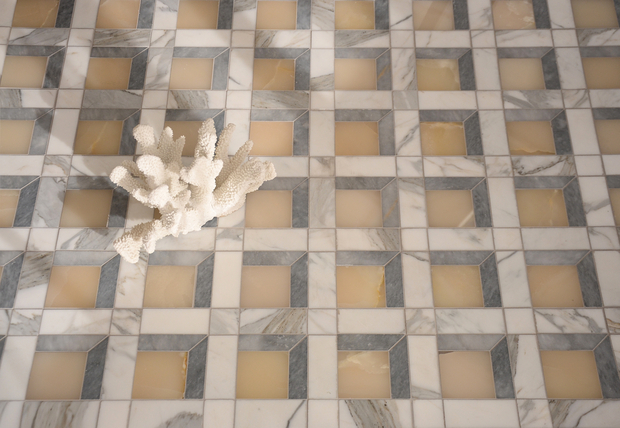 The collection consists of seven mosaic designs hand-crafted in natural stone, jewel glass and shell. The optical patterns are available in multiple colorways of organic tones inspired by land and sea. The mosaics have been hand-cut and assembled by artisans on the Eastern Shore of Virginia. Every mosaic in the Illusions Collection is a custom creation, sized to fit each installation. The mosaics can be installed on both vertical and horizontal surfaces, indoors and out. The Illusions Collection is available at all New Ravenna showrooms throughout the United States, Canada, Europe, Russia, and Dubai.